Diet-to-Go is a leading meal delivery diet that helps you lose weight while enjoying gourmet-like food. Here are the advantages and disadvantages if Diet-to-Go. Losing weight with Diet-to-Go is very convenient. Everyday coming home from work you will be less tempted by the fattening fast food services because you know what will be ready for dinner at home, even with no shopping or prep work. Most meals slide straight out of the freezer and into the microwave. Food is ready in less than 6 minutes. The dinners in this diet plan are both filling and healthy. They come with a great taste and an abundance of variety for you to select from. They are also great starter dishes if you like to create your own meals by adding more vegetables or spices and will cut down on prep time greatly. Diet-to-Go requires no cancellation fees or gimmick pricing. There is no commitment or contract, and they offer a 100% satisfaction guarantee. You can pause, stop or restart your diet meal plan at any time. This makes the diet an easy to try plan without risks. In the event you find a meal you don’t like, Diet-to Go has a wonderful meal substitution plan that makes it easy to select a new dish. Diet-to-Go hosts a wide variety of meals for traditional dieters, vegetarians, and low-carb dieters. 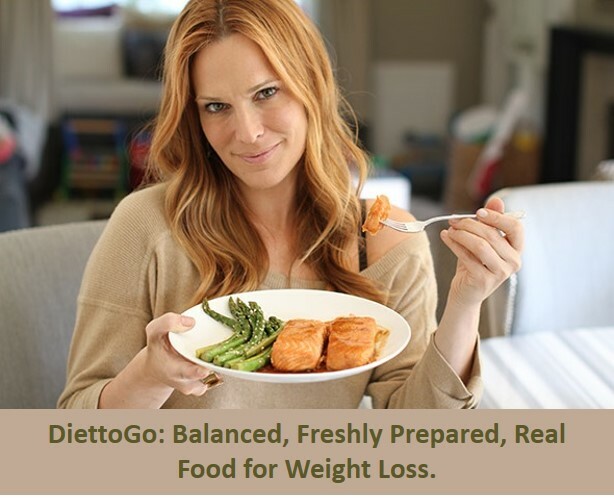 Diet-to-Go offers you a wide variety of food to eat without you having to learn any new recipes. This meal plan gives you new foods, which you typically would not get to have, without a high price tag. Price is competitive in the industry, and you can save 15% if you use the coupon “15percent”. The calorie content in each meal may be high for some dieters. The Wahoo Fish Burger, which is a fairly small dish, contains 650 calories. However, with proper exercise this is not an excessively high calorie count. To see the weight come off quickly, most people generally keep calories in each meal less than 500 calories, but there is a theory according to which if you alternate between high and low calorie meals you get to lose weight faster. Some Diet-to-Go meals are also high in sodium. The nutritional information sometimes is missing. The backside of each meal has ingredients information. However, some dieters have reported meals coming without this information. This is of course very rare. When it happens, it can make it difficult to track calories, sodium intake, and other important factors. Diet-to-Go’s customer support is live 24/7 and very friendly when it comes to helping you deal with these issues. Overall, Diet-to-Go, like all programs, has its pros and cons. However, in the end the customer must decide which outweighs the other. One advantage that eating prepared meals has is that you don’t get to throw away unused food. There isn’t any unused food. We all tend to buy groceries in excess of what we need, and we end up throwing some food away because we never cooked it. With Diet-to-Go the meals are already prepared which prevents over shopping.